It’s officially Spring here in South Georgia. It doesn’t matter what the date is, spring doesn’t truly begin until the pecan trees start to bud out. They have done that, as you see, so I made it to the local nurseries to get some flowers to start planting. Breaking up your fallow ground is just a step in the process. Something should be planted that will make the soil productive and fruitful again. As you’ll see, I’ll be working on the content of this blog (and considering starting a new blog) for Break Up Your Fallow Ground. The garden part will come as I do tasks in the garden. But, what do I want to say about other areas in life where I need to, and am trying to, break up my fallow ground? And, do I always connect it with what I’ve written about the garden – like this one, “it’s Spring”? I guess that’s another part of the process of breaking up fallow ground – what, where, when, and how; and then, what do you plant. The verse above seems a good foundation. Retire and Break Up Your Fallow Ground? Here’s a section of the vegetable garden as it has looked since last Summer, and the rest of the garden and the flower beds look much the same. 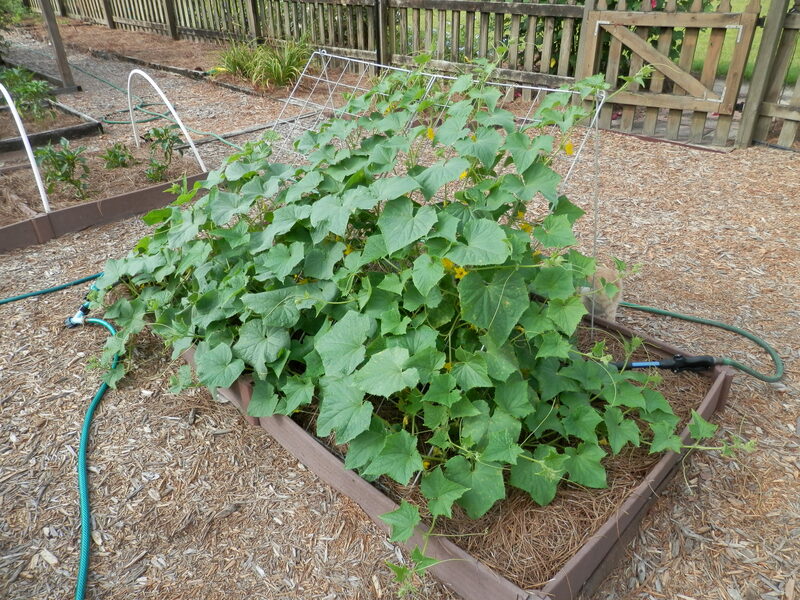 Some of the beds are overgrown. Weeds have punctured the landscape fabric in the walkways and the cypress mulch that once covered them has disintegrated. 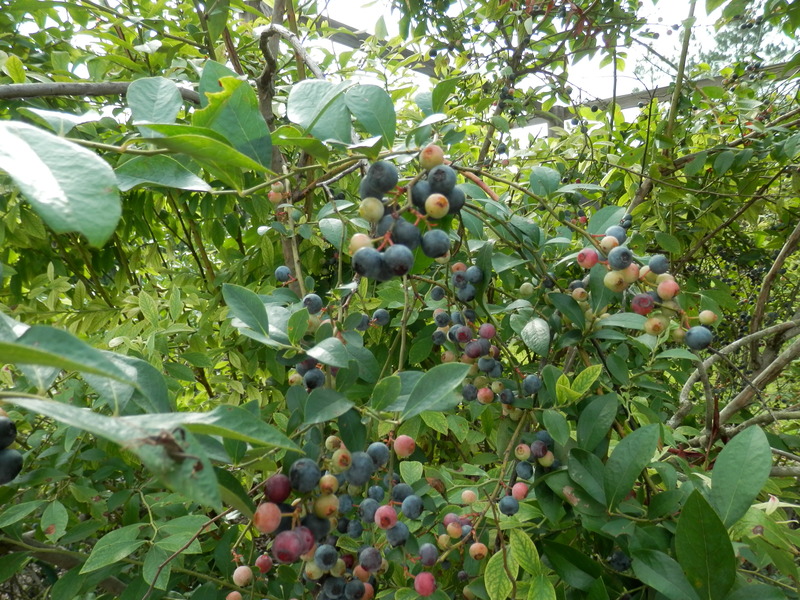 Last summer I listed all the things I needed to do in the garden – in addition to new walkways and rebuilding beds, it needs an irrigation system, the pump house needs rebuilding, the blueberries need something to keep the deer out, and on and on. I realized I had no extra time to work on it, so I decided to let the ground lie fallow (remain idle and unproductive) until my planned retirement in January and then I could begin rebuilding it all. I’ve been pondering what I’ve left idle and unproductive in the garden and figuring out how to address the different pieces and parts (or pieces and plants?) My thoughts eventually led to considerations about other areas of my life that I might have also left idle and unproductive (or perhaps underproductive.) While full time work work was a great blessing in its time, it also kept me from doing other things – most often for valid reasons, but it also can be just an excuse. 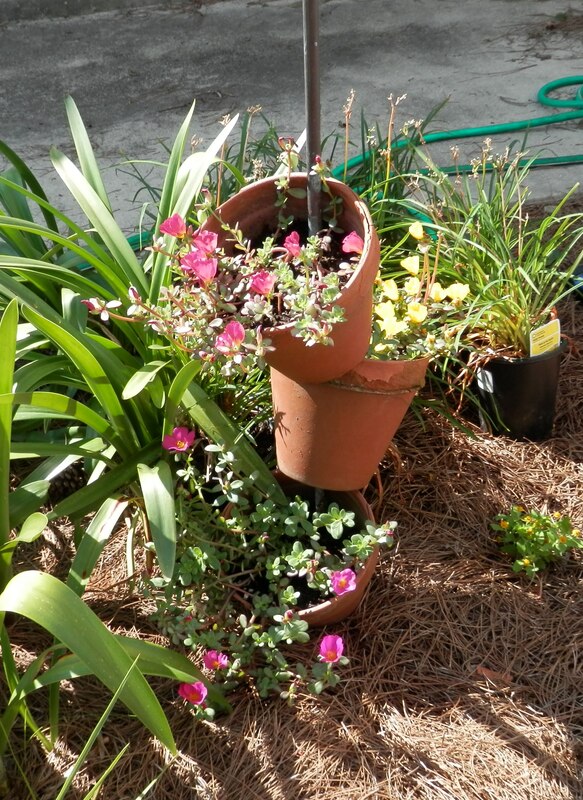 I took those thoughts of the garden, my life, and this verse and decided to make “Break Up Your Fallow Ground” the theme of this beginning of my retirement. One section of fallow ground is my writing and this blog. So, after several unproductive years, I’ve decided to write about breaking up fallow ground – literally and spiritually and wherever else it might lead. I hope it will give you something to think about, too. What Big Eyes You Have! What a Big Heart God Has! I found this bug while inspecting a power pole. (Looking for the pole’s birthmark – probably blog on that sometime). Since my head was rather close to the pole as I moved around it, the bug and I came eye to eye – and I flinched first. The fake eyes did what they were supposed to do, and made me back off. 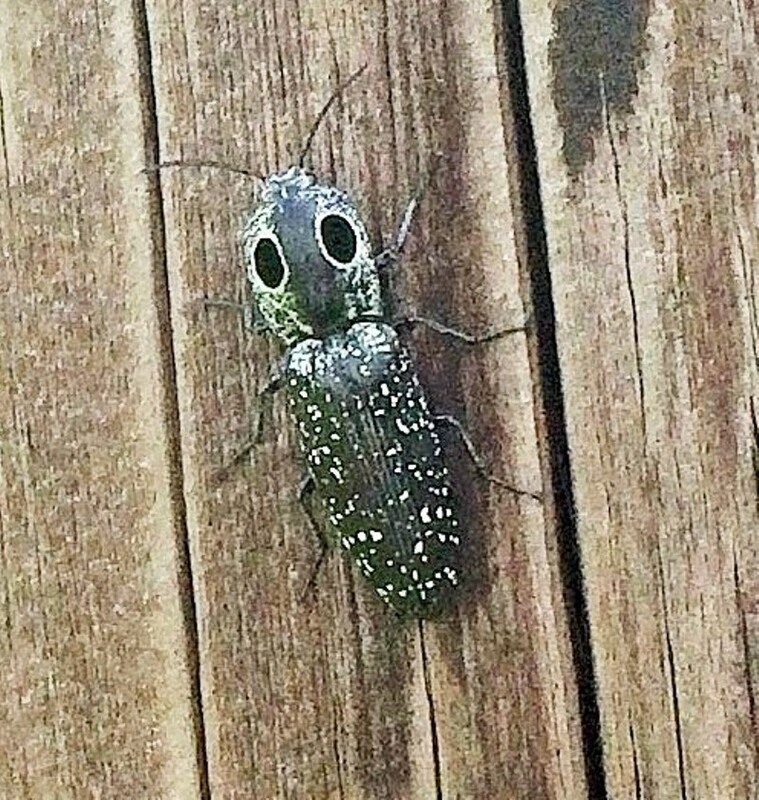 I later looked it up and found it is an “eyed click beetle”. Definitely right on the eyes but didn’t get to hear it click. Big, fake eyes don’t see much. 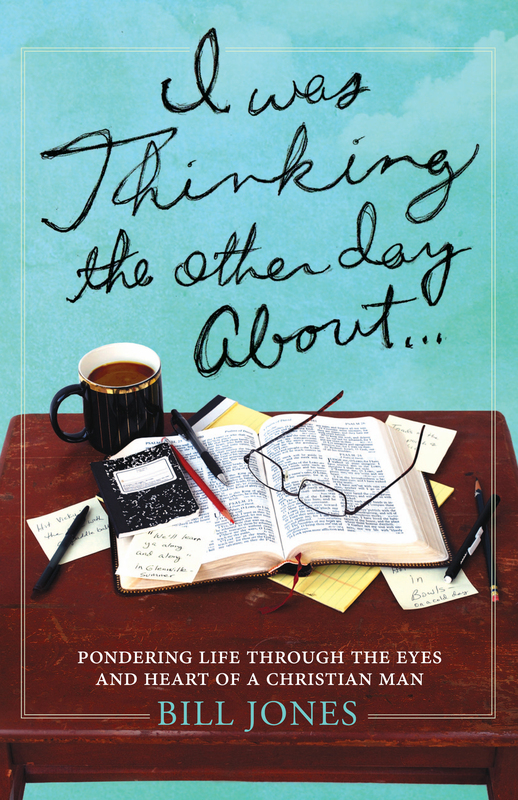 But, the proverbs says our “eyes” (actually referring to our mind’s eye) see what we want to see – making excuses for the wrongs we do. But, the Lord sees clearly into our mind’s eye and on into our heart. Yet, He is still faithful and just to forgive us when we confess. Praise the Lord for His big heart! It’s a great blueberry season – and still going. You can see other pictures on the blog of my structure and netting I built to protect these from the birds. There probably will be enough to share without using the netting this year. 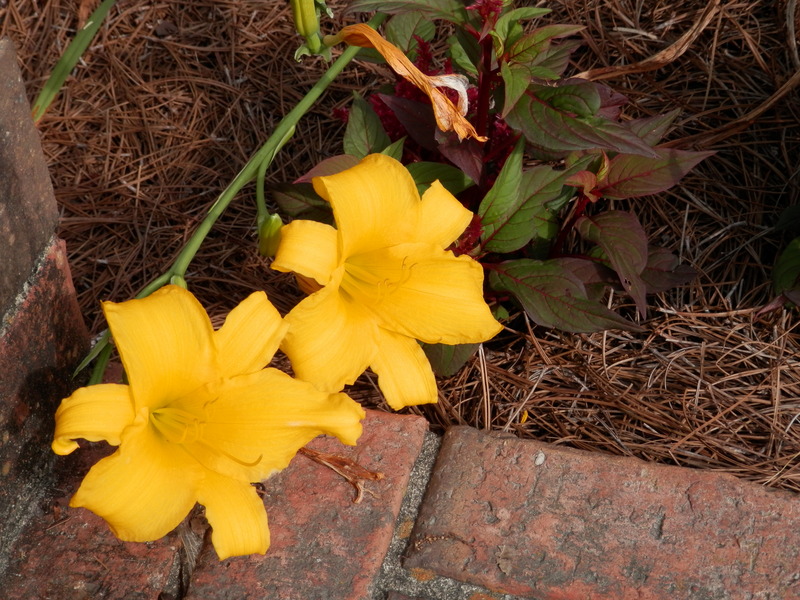 Two things I did – during winter, I cut them back rather severely (we have six large bushes over 6 feet high), and also had a soil test done showing the bed needed sulfur – which I added. And, as I said, wonderful crop this year. We truly have an abundance of so many things – mainly God’s blessings. Sharon bought me this neat little flower pot holder several years ago. It’s a simple copper rod with a base to hold it up. It took a few seasons to discover that purslane fits it perfectly. 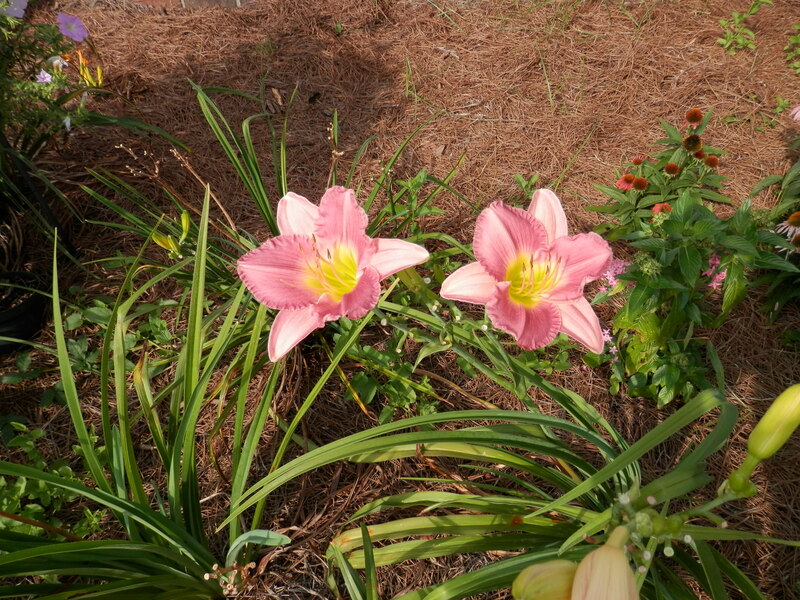 These are re-blooming day lilies, and they actually have a nice scent, too. They’ve been putting out blooms for a month now and show no signs of stopping. We (I) need to remember our prayer shouldn’t be only asking for help, or mercy. Praising God should be a focus. 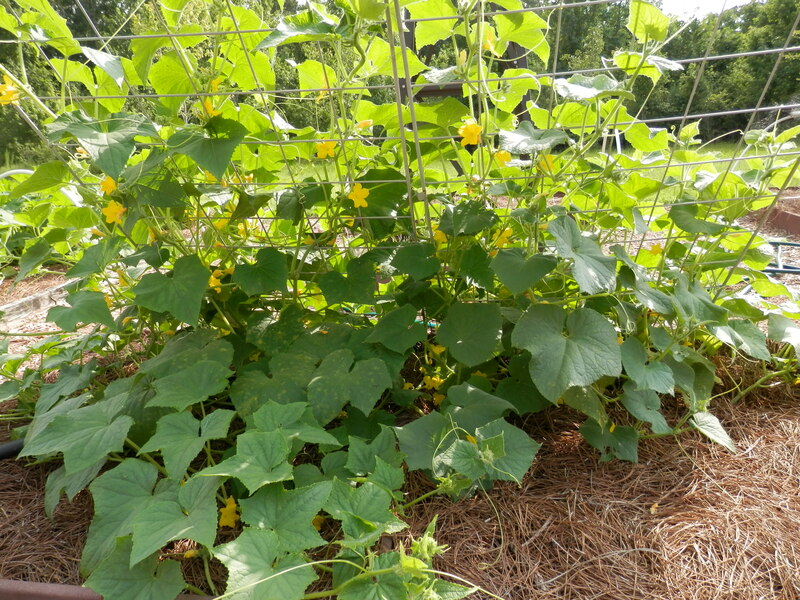 Got a late start on the vegetables this year, but they seem to be catching up nicely.